This is Day 2 in a series. You might want to checkout the previous day, or start at the introduction. If you've ever talked with me about TV shows, you'd know that I really don't watch procedural shows; I tend to spend all of my time watching serial shows. If you don't know the difference, procedural shows are shows like CSI or Seinfeld where nothing really changes from week to week. Something may change over the course of a season or two, but the viewer can usually skip an episode or twelve without missing anything at all. Sitcoms and crime dramas tend to be procedural, so I tend not to watch them. Serial shows, on the other hand, are shows where there is an overarching storyline that persists from week to week with new developments each episode. Examples of these would be Lost or Heroes. It's probably because I put too much of an emphasis on story in media, but I can't stay interested in a procedural show. If there is nothing that reoccurs each week, I can't be bothered to tune in again. 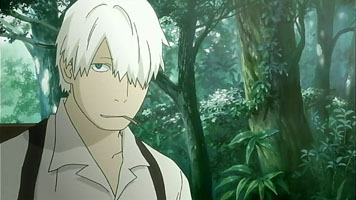 Which is why it's strange that I love Mushi-shi so much. Mushi-shi is an anthology, which is a step even further abstracted from procedural shows. Not only do the episodes not have any connection besides the same main character, but they are so unrelated they could be shown in any order and still make the same amount of sense. There is no over-story, no mystery to solve. It's simply the adventures of a man from week to week. It's not entirely fair to say that the show has no main story, but the story is only brought up twice. It's the mystery of where the main character came from, so nothing earth shaking, but it is fascinating. of the show quite well. The main character is named Ginko. He is what is known as a mushi-shi - a kind of traveling doctor. He specializes in dealing with mushi: tiny little creatures that most people cannot see who often cause problems for humans unintentionally. Mushi come in all different shapes and sizes, and cause everything from blindness to forgetfulness to rust to harvests... The list goes on and on. Ginko tends to attract mushi to himself, so he never settles down in any place for too long. He doesn't want misfortune to befall any of the people he would be staying with. Mushi are not evil, they just tend to cause problems for the humans they are residing near. Sometimes they are actually helpful for the humans, but more often than not they aren't. Ginko is a mushi expert, so he knows all of the treatments for each type of mushi. The entire series focuses on the different people that he visits and their problems. In some episodes he does not even show up until the last five minutes, with all of the rest of the time spent watching the affected people cope with their mushi-related problems. The most amazing part of this show is its pace. This is probably the slowest show that I have ever watched. I'm not sure how to describe the feeling that it gives, because the show itself isn't all that slow; each episode has a beginning and end and no story takes more than one episode to tell. There are no "To be continued"s. It simply...is. Some episodes take place over several years. There's a lot of dialogue in the show, with Ginko listening to the problem for several minutes and then describing what the cause and solution are. The third episode of the show takes place in the snow, looking at an isolated cabin. Somehow, that episode managed to capture the feeling of winter perfectly. I felt like I was out in the cold while I was watching it. Another great part about this show is the music. The opening song is very pretty, and I still listen to it from time to time. What's really special about this show is that it never plays the same song twice as the ending song. That uniqueness of each ending really made it feel special when the music started and the credits faded in. I call this a "Folklore Anthology" show, but really it is not real folklore (at least not as far as I can tell). Mushi were apparently not a real belief back in the day, but the show does a good job presenting them as historical myths. In fact, I thought that they were based off of an ancient Japanese myth until very recently when I learned otherwise. The series is set back in the time before Japan opened up to the rest of the world, so it has no technology in it to speak of. Everyone walks everywhere at a nice leisurely pace, taking time to enjoy the journey. Fields are farmed by hand. It's all so quaint. I honestly have no idea why this is one of my favourite shows. It's so opposite of what I usually enjoy watching, yet it's also so riveting. It may be because its so calming, I don't know. I feel like it really captured the feeling of the land back in those days, and it's so easy to slip into their world through this show. There is no resolution when you watch the final episode, but that's ok. The last episode is just like all the ones before it, as if to say: "Life continues on. Nothing need change for him. He's doing good where he is now." The series ends, but Ginko will keep helping people until he dies. Tomorrow, I'm going to do what I said I wouldn't do, and talk about the most popular anime from 2012.